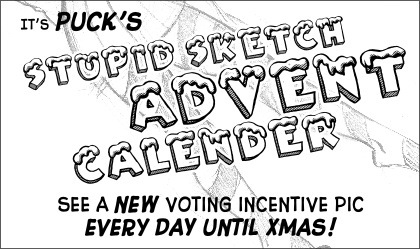 New Daily Voting Incentive: PUCK’S STUPID SKETCH ADVENT CALENDAR!!! It’s a Stupid Sketch Puck Advent Calendar! Count down to Christmas with 25 holiday-themed sketches! Instead of putting a whole bunch of effort into one really good pic, I made 25 mildly crappy yet entertaining ones! Vote to see today’s special pic! CLICK HERE TO VOTE FOR PUCK! GET OFF THE NAUGHTY LIST! For those of you sceptical about the existence of a stroller that costs $1000, believe me, there’s a bunch of them. And for those of you who doubt the fact that any human being in his or her right mind would ever pay that much money for a f#$%ing stroller, let me reassure you that people can get pissy and competitive about anything. Oh, and for our non-Canadian readers, Canadian $100 bills are brown. They have a picture of Robert Borden (prime minister 1911-1920) on them. They’re also usually made of a weird, semi-transparent plastic material now. It’s kind of strange and makes me long for the old-fashioned goodness of paper money. And for those who are curious, no, ‘bringing home the Bordens’ is not something we say up here. The baby reaction faces are kind of fun to do right now. It does sort of feel like that, doesn’t it? I mean, you cannot say that you wouldn’t know from the plan. if looks could kill, Tracee would be six feet under right now. Ah, but you don’t get to where Tracee is today without developing some serious defenses against looks that can kill. I think she’s totally immune to death stares now. Can you actually stuff 100 (one Hundred) Bordens into a No 10 envelope like that to make the 10 large? That last is sorta the theme of Twain’s “The £1,000,000 Bank-Note”, which is worth a read. Those 2 dollar bills are so old, you could get about 50 bucks from a collector for one. Actually, I got some crisp new US $2 bills from my bank about a year ago. People do a double-take, but they accept them. In answer to that, no, you likely can’t stuff one hundred bills into an envelope, but you can try. And the banks don’t even give out thousand dollar notes anymore without making you sign a waiver and promise to bring it back at the end of the day. Seriously, they’re pretty uptight about those things. Mind you, if anyone has them, I’m guessing it would be Satan. I purposely got some $2.00 bills from the bank so that I could pass them. It mostly fizzled, but one McDonald’s cashier had to ask her manager if they took that money. I didn’t think the bank would have two dollar bills anymore, but hey, I’ve never asked. *Both laughs our heads off before she goes back to sleep* (she works night today). As for the 100 dollar bills being brown, I vaguely recall reading about that sometime or another. Thought I imagined things. Thanks for proving me right! As for strollers costing… A lot, I don’t have a problem believing that; there’s strollers here in Sweden as well that costs easily €100-200+ and people STILL BUY THOSE. When my girlfriend and I talked about it a few days ago, she said (I’m just quoting her here) “if [I] try convincing [her] to buy a stroller that costs more than €50, [she’ll] break up with [me] on the spot”. The expensive strollers are actually almost worth the money if you like to do lots of walking. My wife and I once owned a Chariot double stroller (cost: $500-$1000 or so) which we got used. That was after struggling with a cheaper double stroller (which we also got used). The cheaper one was so heavy and awkward that it was almost impossible to move. The chariot (aluminum frame, mountain bike wheels) was light as a feather, incredibly well balanced, and made walking with kids WAY easier, especially up hills. The good news, though, is that they’re also made to last forever, so one Chariot stroller can be bought used, put to work for a few years, then sold for pretty much the same value. That said, most parents don’t actually WALK with their kids, so the deluxe stroller is kind of worthless. I’m talking as a parent who, for many years, only had one car, which my wife would take to work, leaving me without transportation. The $1000 stroller was a lifeline. But I’m in the minority here. Frodo is wishing Mt. Doom had more lava. Because it’s nice and toasty warm! Well, when the lava’s shooting out gold coins, it’s hard not to have a death wish. Oh man, don’t get me started on Patreon campaigns. Hate to be ‘that guy’, but studies show that carrying your baby can lead to increased intelligence, while strollers and such do not. Collin must have been a stroller baby. Colin is a bottle-fed stroller baby. But there are worse fates in life. And like the bottle feeding/breast feeding thing, I’m sure you won’t be able to see any difference between 2 adults. @Kaiser. I think it’s a play on “Bugaboo” strollers. These are aimed at the high end market costing €500 to €1600. High price but it does mean they can afford not to skip on quality. Many in the competitive low end market must do to that to keep price down. So they design much closer to the minimal legal requirements for safety and comfort. Strollers are deceptively simple and because of that many people are surprised to hear Bugaboo has a much larger engineering department than many other same sized companies I visited. I saw one service report on a stroller that got hit by a speeding car sending it flying and tumbling. The stroller got destroyed as it absorbed the impact which made that the baby was unharmed. And that while car collisions is not something strollers are tested on (they are tested on impact though). Good engineering. Having said this, there will be others stroller around of the same technical quality but which are cheaper as they lack the popularity and reputation. Not at €50 though. Or at least not those I’ve seen. But that does not mean a €50 stroller wouldn’t work for you. You have to choose what works best for your situation and budget (I can’t afford a Bugaboo either). One advice is to make sure you get to test the stroller before you buy it. Fill a bag so it has the weight and size of a baby and put it in the seat. Also bring what else you’d expect to bring with you (diaper bag, food, bottles, tissues, toys, etc.) and see if it all fits. They push it around, up and down sidewalks, hills, etc. Also see if the stroller has space for groceries etc. for when you take the baby out and go shopping. And if it fits in your car alongside shopping. Oh, I forgot. Better quality strollers survive longer and there is a good chance you find a good one used. Check the “for sale” pages. Exactly. Which is what I did, and I can say firsthand that a really high-end stroller is actually worth it most of the time. If you actually walk much. My older sisters Joy and Gloria and myself never had a stroller like that. No matter who loses, Puck wins. That’s the kind of game I like to play. That cash has to pay for Dap’s gambling debts right? She’s not just going to blow it right? It shall be spent like all cash windfalls are spent: on frivolous and wholly unnecessary purchases. The expression on the baby’s face, priceless. Well, it actually had a bill of $11,000, but it was worth it. Well, she didn’t get where she was today without being able to put people in their place. I think. Took me a minute to realize they were ten thousand Canadian…thought the color was off. Force of habit…can’t make jokes about “funny money” ’cause the US stuff is looking funnier every time they fiddle with the design. I know Americans immediately connect color-coded bills with Monopoly, but seriously, it’s a smart, smart system. Why make a money system where a one dollar bill can potentially be mistaken for a hundred dollar bill? Only in America. Though I know that the American government has long looked enviously at the Canadian money system and has started to copy a lot of our initiatives. Your penny’s going to disappear real soon, I bet. Once the pragmatic Canadians take the plunge, you can bet the Americans will be jumping in soon enough. Yup. Penny and the dollar bill. No matter how many times the bureaucrats are told that we like the penny and the dollar bill and want to keep them, they come back in a few weeks or months with some scheme to try to get rid of them again. They used to be 100% nickel. Now they’re steel with a nickel plating. Scratch the nickel plating and it’ll rust something fierce, though the nickel plating is pretty tough, so that doesn’t usually happen. I like cash. It’s a great load off your mind knowing something you’ve bought won’t be repossessed because you paid cash for it. Best for food, which you can’t return anyway. Heather 2 – Tracee 10. For those of you who are still rooting for Heather, the second half is about to begin and she still has time to make a comeback! ps. I’m still laughing… I just see this image of a boiler exploding and brown gravy flying EVERYWHERE!!!!!! I’m reasonably happy with that line, especially considering the fact that I had no idea what Puck or Daphne were going to say in panel four until I was putting the finishing touches on the comic. My rough draft of the strip just said “Puck and Daphne say something funny here” for panel four. That’s it. For an entirely improvised line, I think it’s pretty good. Everything I know about steam technology, by the way, I learned from Thomas the Tank Engine. I told ya they was organized. I think the forth frame may be the most humanized we have seen the baby as of yet. Not only does she have a visible face, but we can see her looking at something and having a corresponding expression. I guess it takes a parent to notice. Well, it’s only now that I’m vaguely transitioning to having the baby show any real form of interaction. They take a while to get to the point where their eyes can even focus on something, so I wanted to reflect that. Seriously, though, if this storyline keeps getting better, I am going need a new pair of pants! You, Sir, are a genius! Well, thanks for the vote of confidence. I’m just honestly muddling through this as best I can. It’s what I do. Damn, that’s a lotta cash. They do say money is the root of all evil. It comes as no surprise that Old Nick would be growing himself a lush crop of the stuff, the better to corrupt others. He’s still burning through all those royalty cheques he got from the heady days of 80’s metal, when any band worth its salt had a strong affiliation with him. Weird side note: in the ten year time span that I ceased doing Puck, I briefly considered doing a Flash-based cartoon about Santa’s Workshop, starring a weary and cynical Puck lookalike elf. Didn’t get very far, but it was a cute idea. And Daphne is worried. She knows well enough that when you’re on a winning streak at the craps table, you stop playing craps. I believe that the money will be used to get Miranda into college. A waste of good money, given how expensive higher education is these days. Better to find a way to get the government to pay for the education, and then use the money for more practical things later. I don’t get the reference on Daphne’s shirt. The arrow is pointing at her t!t$ (one of them anyway). So does she want milk with her cookies? Uh, no. You’re overthinking it.